A class of service definition (CoS) shares attributes between entries in a way that is transparent to applications. CoS simplifies entry management and reduces storage requirements. Clients of the Directory Server read the attributes in a user's entry. With CoS, some attribute values may not be stored within the entry itself. Instead, these attribute values are generated by class of service logic as the entry is sent to the client application. CoS definition entry. The CoS definition entry identifies the type of CoS used. Like the role definition entry, it inherits from the LDAPsubentry object class. The CoS definition entry is below the branch at which it is effective. Template entry. The CoS template entry contains a list of the shared attribute values. Changes to the template entry attribute values are automatically applied to all the entries within the scope of the CoS. A single CoS might have more than one template entry associated with it. The CoS definition entry and template entry interact to provide attribute information to their target entries, any entry within the scope of the CoS. The CoS definition entry is an instance of the cosSuperDefinition object class. The CoS definition entry also contains one of three object class that specifies the type of template entry it uses to generate the entry. The target entries which interact with the CoS share the same parent as the CoS definition entry. Pointer CoS. A pointer CoS identifies the template entry using the template DN only. Indirect CoS. An indirect CoS identifies the template entry using the value of one of the target entry's attributes. For example, an indirect CoS might specify the manager attribute of a target entry. The value of the manager attribute is then used to identify the template entry. The target entry's attribute must be single-valued and contain a DN. 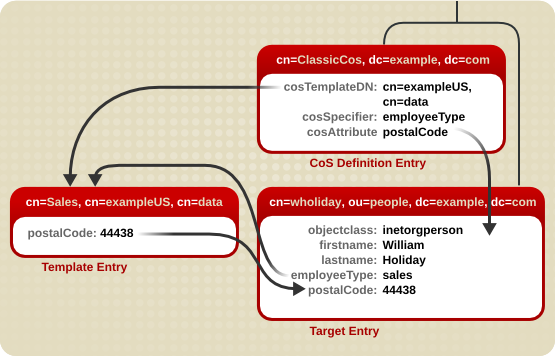 Classic CoS. A classic CoS identifies the template entry using a combination of the template entry's base DN and the value of one of the target entry's attributes. For more information about the object classes and attributes associated with each type of CoS, see Section 7.2.11, “Managing CoS from the Command Line”. If the CoS logic detects that an entry contains an attribute for which the CoS is generating values, the CoS, by default, supplies the client application with the attribute value in the entry itself. However, the CoS definition entry can control this behavior. The CoS template entry contains the value or values of the attributes generated by the CoS logic. 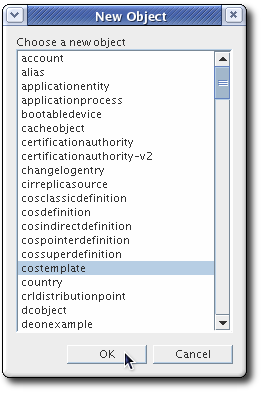 The CoS template entry contains a general object class of cosTemplate. 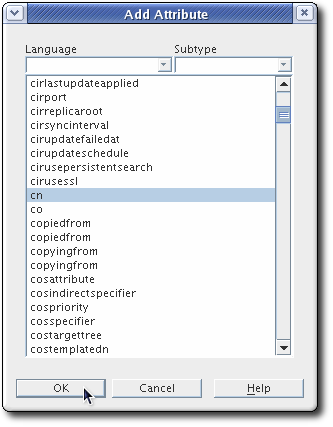 The CoS template entries for a given CoS are stored in the directory tree along with the CoS definition. The DN of the template entry alone. This type of template is associated with a pointer CoS definition. The value of one of the target entry's attributes. 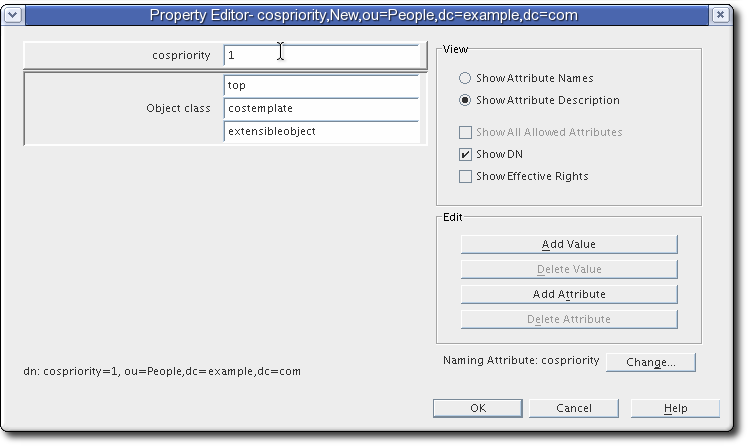 The attribute used to provide the relative DN to the template entry is specified in the CoS definition entry using the cosIndirectSpecifier attribute. This type of template is associated with an indirect CoS definition. By a combination of the DN of the subtree where the CoS performs a one level search for templates and the value of one of the target entry's attributes. This type of template is associated with a classic CoS definition. An administrator creates a pointer CoS that shares a common postal code with all of the entries stored under dc=example,dc=com. The three entries for this CoS appear as illustrated in Figure 7.1, “Sample Pointer CoS”. In this example, the template entry is identified by its DN, cn=exampleUS,cn=data, in the CoS definition entry. Each time the postalCode attribute is queried on the entry cn=wholiday,ou=people,dc=example,dc=com, the Directory Server returns the value available in the template entry cn=exampleUS,cn=data. An administrator creates an indirect CoS that uses the manager attribute of the target entry to identify the template entry. The three CoS entries appear as illustrated in Figure 7.2, “Sample Indirect CoS”. In this example, the target entry for William Holiday contains the indirect specifier, the manager attribute. William's manager is Carla Fuentes, so the manager attribute contains a pointer to the DN of the template entry, cn=Carla Fuentes,ou=people,dc=example,dc=com. The template entry in turn provides the departmentNumber attribute value of 318842. In this example, the CoS definition entry's cosSpecifier attribute specifies the employeeType attribute. This attribute, in combination with the template DN, identify the template entry as cn=sales,cn=exampleUS,cn=data. The template entry then provides the value of the postalCode attribute to the target entry. The cosAttribute attribute contains the name of another attribute which is governed by the class of service. This attribute allows an override qualifier after the attribute value which sets how the CoS handles existing attribute values on entries when it generates attribute values. default: Only returns a generated value if there is no corresponding attribute value stored with the entry. override: Always returns the value generated by the CoS, even when there is a value stored with the entry. operational: Returns a generated attribute only if it is explicitly requested in the search. Operational attributes do not need to pass a schema check in order to be returned. When operational is used, it also overrides any existing attribute values. An attribute can only be made operational if it is defined as operational in the schema. For example, if the CoS generates a value for the description attribute, it is not possible to use the operational qualifier because this attribute is not marked operational in the schema. operational-default: Only returns a generated value if there is no corresponding attribute value stored with the entry and if it is explicitly requested in the search. If no qualifier is set, default is assumed. If an entry contains an attribute value generated by a CoS, the value of the attribute cannot be manually updated if it is defined with the operational or override qualifiers. For more information about the CoS attributes, see the Red Hat Directory Server Configuration, Command, and File Reference. Any attribute can be generated using a class of service — including multi-valued attributes. That introduces the potential for confusion. Which CoS supplies a value? Any of them or all of them? How is the value selected from competing CoS templates? Does the generated attribute use a single value or multiple values? Creating a rule to merge multiple CoS-generated attributes into the target entry. This results in multiple values in the target entry. Setting a priority to select one CoS value out of competing CoS definitions. This generates one single value for the target entry. Indirect CoS do not support the cosPriority attribute. The way that the CoS handles multiple values for a CoS attribute is defined in whether it uses a merge-schemes qualifier. The merge-schemes qualifier does not affect how the CoS handles physical attribute values or the override qualifier. If there are multiple competing CoS templates or definitions, then the same merge-schemes and override qualifiers have to be set on every cosAttribute for every competing CoS definition. Otherwise, one combination is chosen arbitrarily from all possible CoS definitions. This method only works with classic CoS. However, it may be that even if there are multiple CoS definitions, only one value should be generated for the attribute. If there are multiple CoS definitions, then the value is chosen arbitrarily. This is an unpredictable and unwieldy option. The way to control which CoS template to use is to set a ranking on the template — a priority — and the highest prioritized CoS always "wins" and provides the value. It is fairly common for there to be multiple templates completing to provide a value. For example, there can be a multi-valued cosSpecifier attribute in the CoS definition entry. The template priority is set using the cosPriority attribute. This attribute represents the global priority of a particular template. A priority of zero is the highest priority. This template entry contains the value for the departmentNumber attribute. It has a priority of zero, meaning this template takes precedence over any other conflicting templates that define a different departmentNumber value. Templates that contain no cosPriority attribute are considered the lowest priority. Where two or more templates are considered to supply an attribute value and they have the same (or no) priority, a value is chosen arbitrarily. The behavior for negative cosPriority values is not defined in Directory Server; do not enter negative values. CoS definitions provide values for attributes in entries. For example, a CoS can set the postalCode attribute for every entry in a subtree. Searches against those CoS-defined attributes, however, do not behave like searches against regular entries. The postalCode attribute for Ted Morris is defined by a CoS. The postalCode attribute for Barbara Jensen is set in her entry. The postalCode attribute is indexed. If an ldapsearch command uses the filter (postalCode=*), then Barbara Jensen's entry is returned, while Ted Morris's is not. The postalCode attribute is not indexed. If an ldapsearch command uses the filter (postalCode=*), then both Barbara Jensen's and Ted Morris's entries are returned. CoS allows for an override, an identifier given to the cosAttribute attribute in the CoS entry, which means that local values for an attribute can override the CoS value. If an override is set on the CoS, then an ldapsearch operation will return a value for an entry even if the attribute is indexed, as long as there is a local value for the entry. Other entries which possess the CoS but do not have a local value will still not be returned in the ldapsearch operation. Because of the potential issues with running LDAP search requests on CoS-defined attributes, take care when deciding which attributes to generate using a CoS. The server controls access to attributes generated by a CoS in exactly the same way as regular stored attributes. However, access control rules depending upon the value of attributes generated by CoS will not work. This is the same restriction that applies to using CoS-generated attributes in search filters. Browse the tree in the left navigation pane, and select the parent entry for the new class of service. 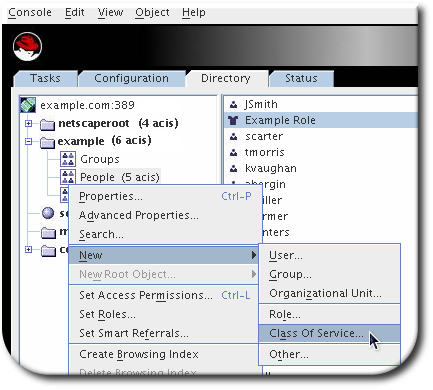 Go to the Object menu, and select New > Class of Service. Alternatively, right-click the entry and select New > Class of Service. Select General in the left pane. 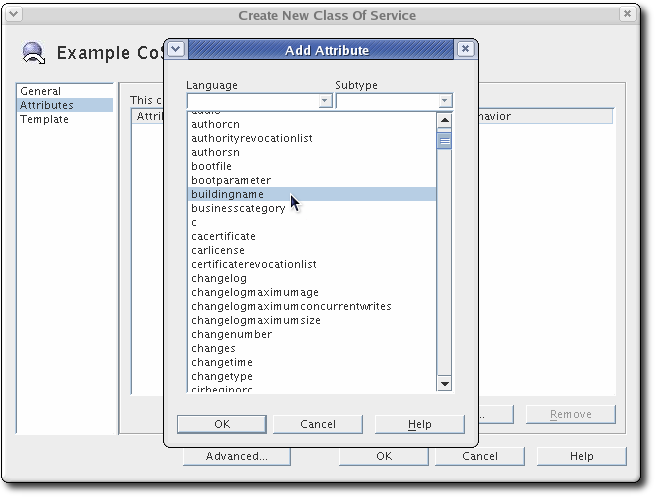 In the right pane, enter the name of the new class of service in the Class Name field. Enter a description of the class in the Description field. Click Attributes in the left pane. The right pane displays a list of attributes generated on the target entries. Click Add to browse the list of possible attributes and add them to the list. 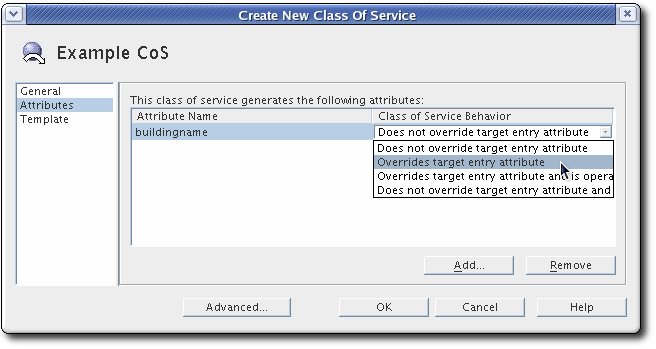 After an attribute is added to the list, a drop-down list appears in the Class of Service Behavior column. Select Does not override target entry attribute to tell the directory to only return a generated value if there is no corresponding attribute value stored with the entry. Select Overrides target entry attribute to make the value of the attribute generated by the CoS override the local value. Select Overrides target entry attribute and is operational to make the attribute override the local value and to make the attribute operational, so that it is not visible to client applications unless explicitly requested. Select Does not override target entry attribute and is operational to tell the directory to return a generated value only if there is no corresponding attribute value stored with the entry and to make the attribute operational (so that it is not visible to client applications unless explicitly requested). An attribute can only be made operational if it is also defined as operational in the schema. For example, if a CoS generates a value for the description attribute, you cannot select Overrides target entry attribute and is operational because this attribute is not marked operational in the schema. Click Template in the left pane. In the right pane, select how the template entry is identified. By its DN. To have the template entry identified by only its DN (a pointer CoS), enter the DN of the template in the Template DN field. Click Browse to locate the DN on the local server. This will be an exact DN, such as cn=CoS template,ou=People,dc=example,dc=com. Using the value of one of the target entry's attribute. To have the template entry identified by the value of one of the target entry's attributes (an indirect CoS), enter the attribute name in the Attribute Name field. Click Change to select a different attribute from the list of available attributes. Using both its DN and the value of one of the target entry's attributes. 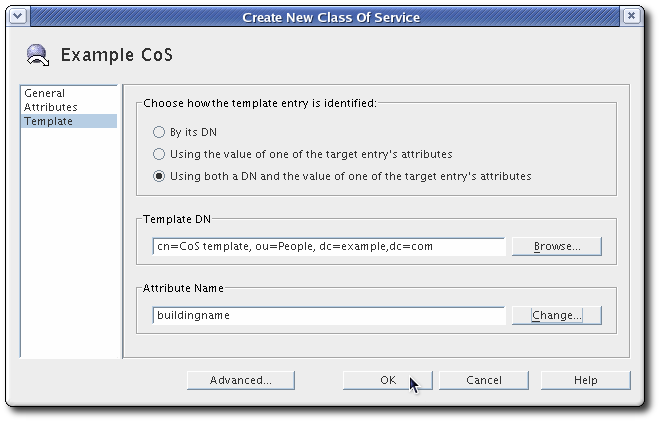 To have the template entry identified by both its DN and the value of one of the target entry's attributes (a classic CoS), enter both a template DN and an attribute name. The template DN in a classic CoS is more general than for a pointer CoS; it references the suffix or subsuffix where the template entries will be. There can be more than one template for a classic CoS.
For a pointer CoS or a classic CoS, there must be a template entry, according to the template DN set when the class of service was created. Although the template entries can be placed anywhere in the directory as long as the cosTemplateDn attribute reflects that DN, it is best to place the template entries under the CoS itself. For a pointer CoS, make sure that this entry reflects the exact DN given when the CoS was created. For a classic CoS, the template DN should be recursive, pointing back to the CoS entry itself as the base suffix for the template. 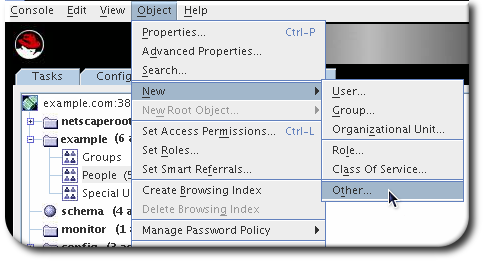 Browse the tree in the left navigation pane, and select the parent entry that contains the class of service. The CoS appears in the right pane with other entries. Right-click the CoS, and select New > Other. Alternatively, select the CoS in the right pane, click Object in the menu at the top, and select New > Other. 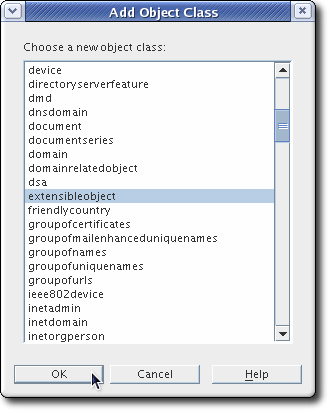 Select cosTemplate from the list of object classes. The LDAPsubentry object class can be added to a new template entry. 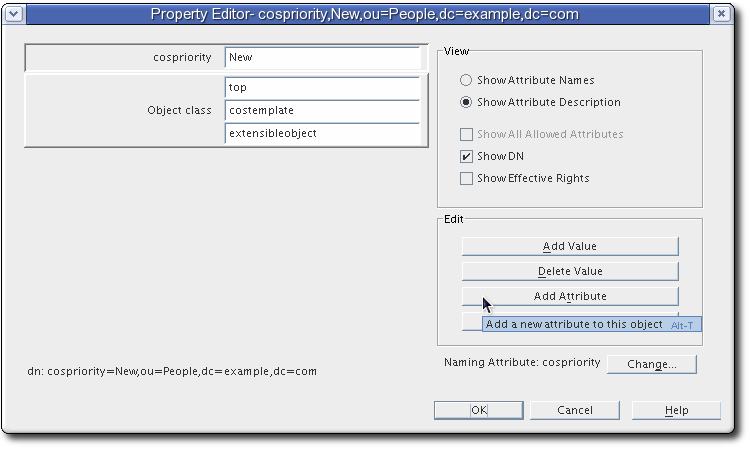 Making the CoS template entry an instance of the LDAPsubentry object class allows ordinary searches to be performed unhindered by the configuration entries. However, if the template entry already exists and is used for something else (for example, if it is a user entry), the LDAPsubentry object class does not need to be added to the template entry. Select the object classes attribute, and click Add Value. Add the extensibleObject object class. This makes it possible to add any attribute available in the directory. Add the cn attribute, and give it a value that corresponds to the attribute value in the target entry. For example, if the manager attribute is used to set the value for a classic CoS, give the cn a value of a manager's DN, such as uid=bparker,ou=people,dc=example,dc=com. Alternatively, set it to a role, such as cn=QA Role,dc=example,dc=com or a regular attribute value. For example, if the employeeType attribute is selected, it can be full time or temporary. Click the Change button in the lower right corner to change the naming attribute. Use the cn of the entry as the naming attribute instead of cospriority. Click the Add Attribute button, and add the attributes listed in the CoS. The values used here will be used throughout the directory in the targeted entries. Set the cospriority. There may be more than one CoS that applies to a given attribute in an entry; the cospriority attribute ranks the importance of that particular CoS. The higher cospriority will take precedence in a conflict. The highest priority is 0. Templates that contain no cosPriority attribute are considered the lowest priority. In the case where two or more templates could supply an attribute value and they have the same (or no) priority, a value is chosen arbitrarily. The cosPriority attribute is not supported by indirect CoS. The CoS is visible in the left navigation pane once there are entries beneath it. For classic CoS, there can be multiple entries, according to the different potential values of the attribute specifier. To edit the description or attributes generated on the target entry of an existing CoS, simply double-click the CoS entry listed in the Directory tab, and make the appropriate changes in the editor window. Because all configuration information and template data is stored as entries in the directory, standard LDAP tools can be used for CoS configuration and management. Each type of CoS requires a particular object class to be specified in the definition entry. All CoS definition object classes inherit from the LDAPsubentry object class and the cosSuperDefinition object class. A pointer CoS uses the cosPointerDefinition object class. This object class identifies the template entry using an entry DN value specified in the cosTemplateDn attribute, as shown in Example 7.3, “An Example Pointer CoS Entry”. An indirect CoS uses the cosIndirectDefinition object class. This type of CoS identifies the template entry based on the value of one of the target entry's attributes, as specified in the cosIndirectSpecifier attribute. This is illustrated in Example 7.4, “An Example Indirect CoS Entry”. A classic CoS uses the cosClassicDefinition object class. This identifies the template entry using both the template entry's DN (set in the cosTemplateDn attribute) and the value of one of the target entry's attributes (set in the cosSpecifier attribute). This is illustrated in Example 7.5, “An Example Classic CoS Entry”. For a class of service, the object class defines the type of CoS, and the supporting attributes identify which directory entries are affected by defining the CoS template. Every CoS has one additional attribute which can be defined for it: cosAttribute. The purpose of a CoS is to supply attribute values across multiple entries; the cosAttribute attribute defines which attribute the CoS generates values for. Each template entry is an instance of the cosTemplate object class. Consider adding the LDAPsubentry object class to a new template entry. 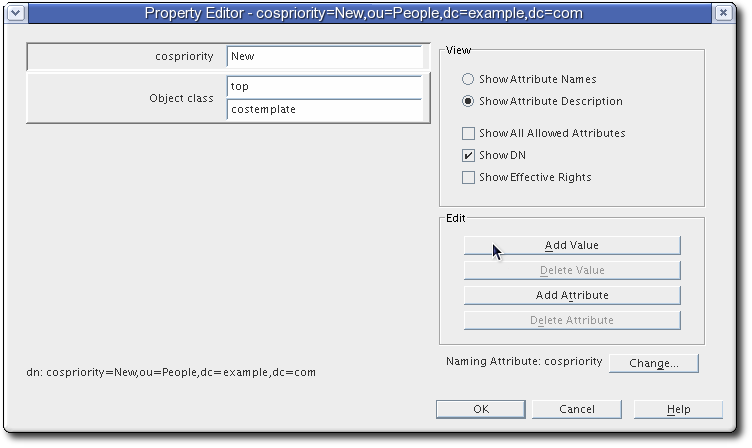 Making the CoS template entry an instance of the LDAPsubentry object classes allows ordinary searches to be performed unhindered by the configuration entries. However, if the template entry already exists and is used for something else, such as a user entry, the LDAPsubentry object class does not need to be added to the template entry. The CoS template entry also contains the attribute generated by the CoS (as specified in the cosAttribute attribute of the CoS definition entry) and the value for that attribute. The following sections provide examples of template entries along with examples of each type of CoS definition entry. Example Corporation's administrator is creating a pointer CoS that shares a common postal code with all entries in the dc=example,dc=com tree. The CoS template entry (cn=exampleUS,ou=data,dc=example,dc=com) supplies the value stored in its postalCode attribute to any entries located under the dc=example,dc=com suffix. These entries are the target entries. 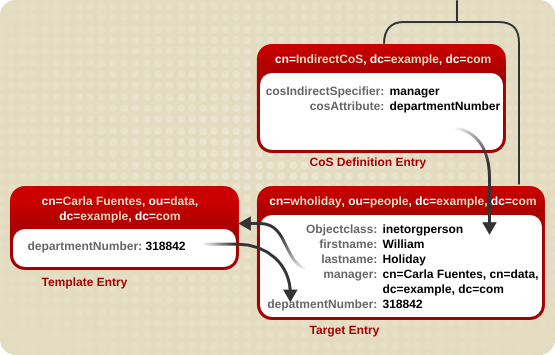 This indirect CoS uses the manager attribute of the target entry to identify the CoS template entry, which varies depending on the different values of the attribute. If the directory or modify the manager entries already contain the departmentNumber attribute, then no other attribute needs to be added to the manager entries. The definition entry looks in the target suffix (the entries under dc=example,dc=com) for entries containing the manager attribute because this attribute is specified in the cosIndirectSpecifier attribute of the definition entry). It then checks the departmentNumber value in the manager entry that is listed. The value of the departmentNumber attribute will automatically be relayed to all of the manager's subordinates that have the manager attribute. The value of departmentNumber will vary depending on the department number listed in the different manager's entries. The Example Corporation administrator is creating a classic CoS that automatically generates postal codes using a combination of the template DN and the attribute specified in the cosSpecifier attribute. The classic CoS definition entry applies to all entries under the dc=example,dc=com suffix. Depending upon the combination of the businessCategory attribute found in the entry and the cosTemplateDn, it can arrive at one of two templates. One, the sales template, provides a postal code specific to employees in the sales department. The marketing template provides a postal code specific to employees in the marketing department. ldapsearch -x -s sub -b ou=People,dc=example,dc=com "(objectclass=*)"
ldapsearch -x -s sub -b ou=People,dc=example,dc=com "(|(objectclass=*)(objectclass=ldapSubEntry))"
This search returns all regular entries in addition to CoS definition entries in the ou=People,dc=example,dc=com subtree. The Console automatically shows CoS entries. Classic CoS schemes generate attribute values for an entry based on the role possessed by the entry. For example, role-based attributes can be used to set the server look-through limit on an entry-by-entry basis. To create a role-based attribute, use the nsRole attribute as the cosSpecifier in the CoS definition entry of a classic CoS. Because the nsRole attribute can be multi-valued, CoS schemes can be defined that have more than one possible template entry. To resolve the ambiguity of which template entry to use, include the cosPriority attribute in the CoS template entry. The nsRoleFilter attribute cannot accept virtual attribute values. 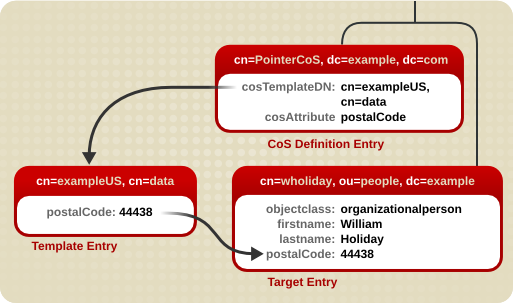 The cosTemplateDn attribute provides a value that, in combination with the attribute specified in the cosSpecifier attribute (in the example, the nsRole attribute of the target entry), identifies the CoS template entry. The CoS template entry provides the value for the mailboxquota attribute. An additional qualifier of override tells the CoS to override any existing mailboxquota attributes values in the target entry. The template provides the value for the mailboxquota attribute, 1000000. The role entry and the CoS definition and template entries should be located at the same level in the directory tree.